Every few weeks, it seems, there’s news of yet another tragic, high-profile train crash that ends up injuring or even killing several passengers. The truth is, there has been an abundance of passenger train accidents across the country in recent years, causing the millions of people who rely on Amtrak, commuter rail, subways, and other passenger trains for their daily commute to worry about the state of railroad safety in America. Too often, these train accidents are caused by acts of sheer negligence on the part of a rail company, such as deteriorating track conditions that go unrepaired, equipment left on the rails, dangerous speeding through hazardous curves, or engineers who are distracted or fatigued while operating the train. These mistakes can have devastating consequences for the passengers and crew riding the train in the form of broken bones and fractures, back and neck injuries, traumatic brain injuries, spinal cord injuries, burns, and other life-threatening injuries. Even innocent bystanders and those living in homes near train tracks can be hurt or killed by a train careening off the track. In fact, nearly 1,000 people are killed in train accidents each year, and thousands of passengers suffer serious injuries annually, according to the Federal Railroad Administration. If you or someone you love was recently injured or killed in a train accident, our attorneys may be able to help you recover compensation for your injuries, pain and suffering, and other damages resulting from a crash or derailment. Fill out our free, no-risk case evaluation form to learn more today. Feb. 4, 2018: An Amtrak train traveling from New York City to Miami hit a stationary freight train and derailed in South Carolina after being mistakenly diverted to the wrong track. Two people were killed and at least 116 people were injured. Jan. 31, 2018: An Amtrak train traveling from Washington, D.C. to West Virginia carrying members of Congress crashed into a truck that tried to cross the tracks, despite reported warnings that a train was coming. Four people on the train were injured, and one passenger in the truck was killed. Dec. 18, 2017: An Amtrak train traveling a new route in Washington state derailed on an overpass. Part of the train plummeted off the overpass onto the highway below. The crash killed three people and injured 80 more. The train was reportedly speeding 50 miles over the speed limit while navigating a curve, which investigators believe caused the derailment. June 27, 2017: A NYC subway derailed in Manhattan, after striking a spare piece of rail that was improperly stored on the tracks, leaving 34 people were injured. Sept. 29, 2016: A New Jersey Transit commuter train crashed into Hoboken Terminal, killing one person and injuring over 100 others. The engineer failed to break as the train traveled into the station, and investigators believe the engineer’s undiagnosed sleep apnea was to blame for the crash. May 12, 2015: An Amtrak train traveling from Washington, D.C. to NYC derailed in Philadelphia after the train engineer accelerated into a curve at over 100 mph in a 50 mph speed zone, killing eight people and injuring around 200 others. Investigators found that the derailment was likely due to engineer distraction, and in Feb. 2018 a Philadelphia judge ruled that the engineer must face criminal trial. What’s Causing These Frequent Train Accidents? There are multiple factors behind the recent train crashes and derailments we’ve seen on the news, but many of them share common examples of improper train handling, train operator negligence, and poor maintenance of the trains and tracks. In many of the deadly train crashes that have occurred over the past few years, the trains were traveling at speeds well above the speed limit, even when approaching hazardous curves that require train engineers to slow down to safely navigate them. Investigators found that the train involved in the 2017 Washington State Amtrak derailment was traveling 80 mph in a 30 mph zone. In the fatal 2013 Metro-North crash in the Bronx, the train involved was reportedly traveling 82 mph when it approached a sharp curve in the rail system. In the case of the 2018 South Carolina Amtrak crash that killed two people, a railroad switch was reportedly set in the wrong position, diverting the train onto another track where a stationary freight train was parked. Other train derailments in recent years, such as the 2016 NJ Transit crash in Hoboken and the 2017 Long Island Rail Road crash in Brooklyn, have been attributed to the operator or engineer of the train suffering from sleep apnea — a sleep disorder also linked to fatigue-related fatal trucking accidents. These accidents have caused train safety advocates and lawmakers to call for improved infrastructure maintenance and mandatory sleep apnea testing for engineers, as well as the implementation of advanced rail safety systems like Positive Train Control, which can automatically stop a train before accidents occur. How Can a Train Accident Attorney Help Me? Victims of train accidents often suffer traumatizing, life-altering injuries that require costly medical attention and treatment, as well as time away from work recovering. A train accident attorney can help you recover compensation for medical bills, lost wages, and other damages by determining liability after the accident. While many train accidents are caused by a railroad company’s negligence, proving fault after an accident is much easier said than done. The federal and state laws surrounding railroad safety are complex and there multiple federal agencies that regulate railroad safety and investigate railroad accidents. An experienced attorney knows the ins and outs of these laws, and can conduct an investigation on your behalf to determine if a railroad company and its employees violated any laws or operated its trains in an unsafe manner that caused the train crash or derailment. In some cases, a manufacturer may be found liable if the train accident was caused by some manufacturing defect with the train or rails, rather than negligence on the part of the company who owns the trains or railways. A train accident attorney can help investigate the cause of the crash or derailment and determine the liable party. There have been a number of victories for the train accident victims and their families seeking justice and accountability for these preventable crashes and derailments. On Oct. 27, 2016, Amtrak agreed to pay a $265 million settlement after its May 2015 train derailment that injured over 200 people in Philadelphia. On Feb. 6, 2018, a Philadelphia judge ordered that the Amtrak engineer must face criminal charges, including involuntary manslaughter and reckless endangerment. Metro-North agreed to pay at least $32 million in settlements and legal costs to the families of passengers injured and killed in the fatal 2013 crash in the Bronx, when the train derailed on a curve near Spuyten-Duyvil. The final cost in settlements may go up and has yet to be determined. On May 9, 2017, a U.S. Transportation Security Administration employee at O’Hare International Airport was awarded $6.65 million after she was seriously hurt by a CTA Blue Line train derailment. The employee can no longer perform her past work as a TSA officer due to the injuries she suffered in the train accident. 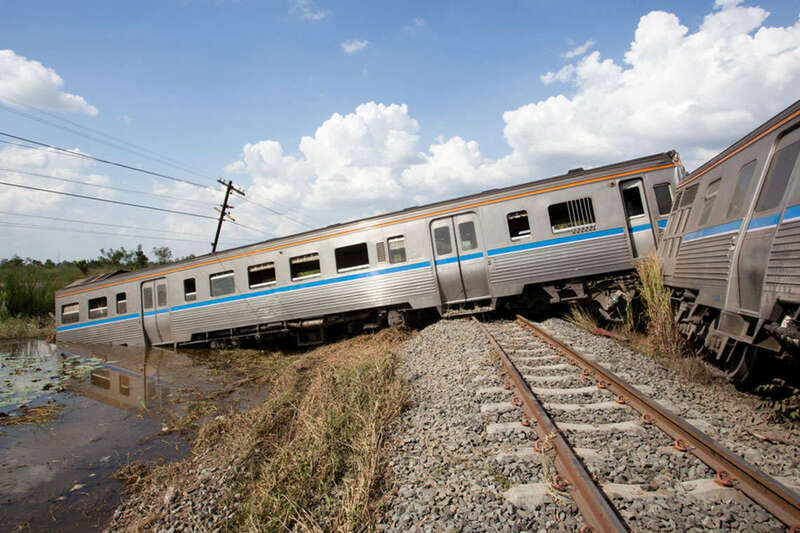 What Compensation Can I Recover in a Train Accident Lawsuit? Train accident victims who participate in a lawsuit can pursue monetary compensation for their injuries in the form of economic, non-economic, and sometimes punitive damages. Current Medical Expenses: This can include fees for emergency room visits, hospital care, surgery, assistive devices and appointments with approved medical professionals after a train crash. Future Medical Expenses: In some cases, the injuries sustained in train crash or derailment are so severe that they will require extended medical attention and care. Lost Wages: Some train accident injuries may be so extensive that they prevent the victim from returning to work temporarily or even permanently. The law permits recovery of compensation for the wages lost between the time of injury and the conclusion of the lawsuit. Loss of earning capacity: If the victim can demonstrate that their ability to earn a living has been negatively impacted by the train crash, compensation may be available. Past wages are considered in determining the amount of this award, as well as the amount of income the victim could have earned had the train accident not occurred. Pain and Suffering: This may include compensation for the physical pain suffered as a result of injuries sustained in the train crash. The nature of the injury, the extent of the pain, and the length of time the victim is expected to suffer are all included in the calculation of the award. Mental Anguish: Train accident victims can also be awarded for emotional pain suffered as a result of the crash or derailment. Mental anguish damages compensate the victim for fright, anxiety, worry, grief and other forms of emotional distress caused by the train accident. Loss of Consortium: A surviving spouse may be awarded compensation for the loss of services, assistance, aid, and companionship of his or her loved one in the case of a wrongful death caused by a train accident. Surviving parents may be awarded compensation for the loss of love, affection and companionship of their minor children as a result of their wrongful death. Minor children may be awarded compensation for the loss of assistance, aid, and companionship of their parents as a result of their wrongful death. Punitive damages, on the other hand, may be awarded if the defendant’s actions causing the accident were willful, malicious, or intentional, in order to punish the offender and dissuade similar conduct in the future. If you were hurt in a train accident that was caused by another person’s or company’s negligence, you shouldn’t have to suffer the consequences. A train accident attorney could help you recover compensation for your injuries, pain and suffering, and other damages. I contacted Morgan & Morgan after an auto accident (someone hit my car while I was driving it). The entire team was great. They answered my questions both face-to-face and by email (quickly) and I understood the procedure from start to finish. They also told me it could take months and it did. They gave me the choice to file a lawsuit or just take what the other insurance company offered. When I told them what I wanted they went ahead. We accomplished what we started out to do and I would use Morgan & Morgan again if I needed legal representation. They are very professional, responsive, and patient. I hoped for the best and that's what I got!